I have lived in the wonderful state of Vermont for the last 25 years. I work at General Electric Healthcare as a software engineer, building systems used in radiology departments. Currently, I work on a team integrating a highly-accurate domain-specific third party voice recognition system into the radiology reporting workflow. I am fortunate to have a beautiful intelligent wife of 29 years, three great teenage children, a really cool dog named Clover, and the cat. I earned a BS in mathematics from Worcester State College in Massachusetts. Toward the end of my senior year, I was introduced to Pascal, and from there, my interests in writing software and computing began to unfold in varied and unpredictable ways, sort of like some CA. I have always had an intense interest in science, mathematics, and the intersection of these with numbers. I think reading about Cantor infinity classes sharpened my interest in how numbers map into the real world. About five years ago, I ran across the NKS book and decided to read it. I found the content deep, with tentacles reaching into the philosophical. I often think, "Just what is this 'reality' that runs in real time so effortlessly?" I think of NKS as a new groundbreaking area of intellectual endeavor similar to quantum theory, the development of calculus and its applications, and the incredible Cambrian explosion in computation theory and computing which is occurring. The book The Day the Universe Changed, by James Burke, talks about how the way we see the world changes throughout history due to new, more accurate ideas. I believe NKS is just that kind of idea. 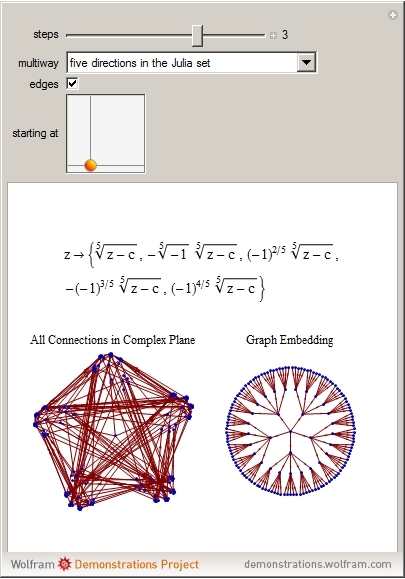 This project demonstrates a multiway system based on function substitutions which are then mapped to complex numbers and displayed in the complex plane. One of the fascinating aspects of this project is that it will display graphs which provide a blend of iterated functions systems that are generated through the Multiway process. A physical layout in the complex plane provides a visualization of the mapping.